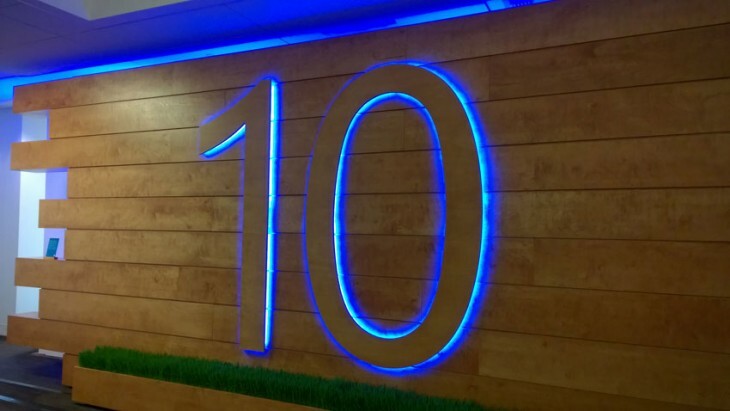 We’ve just wrapped up our live coverage here in Redmond, Washington where Microsoft held its Windows 10 press event. If you missed the two hours of announcements, here’s our recap in one handy list. As usual, click the links for full details of each story. The star of the show, Windows 10 will come as a free update for Windows 7, 8 and 8.1 users for the first year. Windows 10 comes with a more streamlined task bar and the ability to fullscreen the Start menu. The build also has an updated Action button with righthand side notifications bar, offering shortcuts to your favorite apps and settings. When the keyboard is detached from a Windows 10 tablet, it will also ask to go into tablet mode to switch between mobile and PC settings. The new build for Windows 10 arrives next week. Microsoft teased upcoming Windows 10 features that will arrive in the next three to five months – starting with Cortana coming to PC. She will be located right on the lower left corner, where notifications from her will appear. Oh, and Cortana also picked up a few new languages and can do impressions now, if you’re interested in hearing a robot do its best Yoda. To keep its operating system fluid across platforms, Microsoft showed off what Windows 10 will look like for devices with screens that measure 8-inches and smaller, i.e. smartphones and small tablets. Some of the new features include pushing Recent Apps to the top of the Apps list, syncing Action center with PC and most notably, Skype integration with messaging. 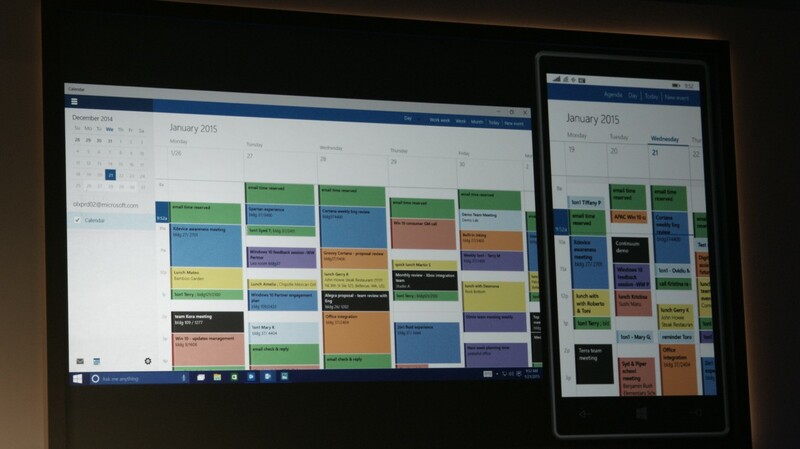 The company also showed what its Office apps will look like on Windows 10 mobile. Recent files will roam between PC, OneDrive and mobile and they’ll now include wireless printing and Miracast. Windows 10 for mobile is slated for February. Now that both PC and phones running Windows 10 will behave similarly, Microsoft has refreshed its apps to make the experience universal. They include Outlook, Calendar, Photos, People and Music, which will sync all your information across devices. 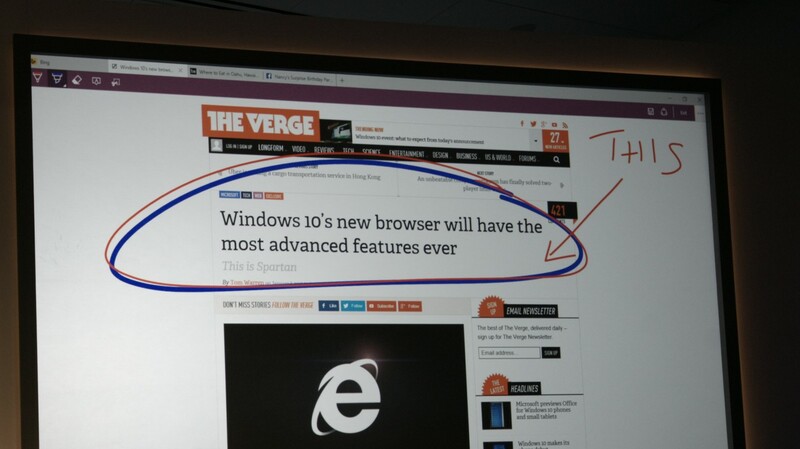 The company’s long-awaited new browser has officially arrived with Project Spartan. The browser supports annotation directly on the Web pages, freezing the page for you to mark up and saving the final result to OneNote for easy sharing. Users can also add items to a Reading List to save webpages offline to read later. It’s also got built-in support for PDF files. 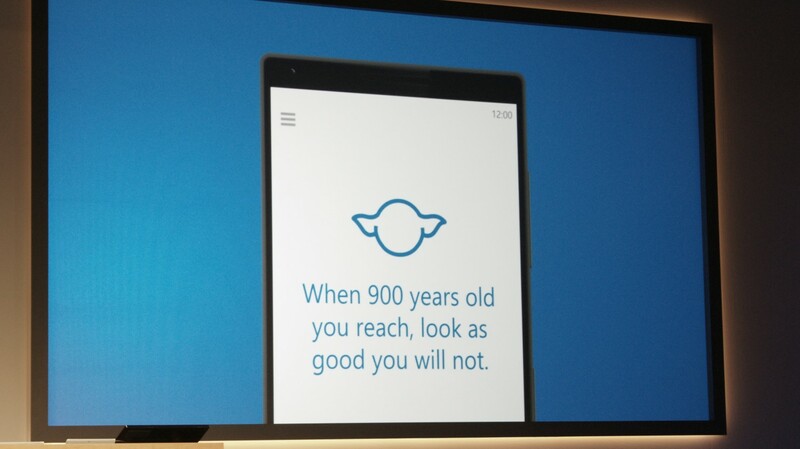 Cortana will be integrated into Spartan as well. For example, typing “weather” into the URL bar will show the answer without you needing to enter the search query. Other Cortana integrations include popping up relevant info on upcoming flights just when you type in the airline website in your URL bar or showing restaurant information and directions from your current location. The new Xbox app on Windows 10 now allows gamers to voice and text chat with their friends on Xbox Live from your PC. You can also browse video game clips and share them Instagram-style. You can film your gaming by hitting Windows+G and record the live clip or save the last 30 seconds from the game DVR. You’re also able to edit them before sharing as well. 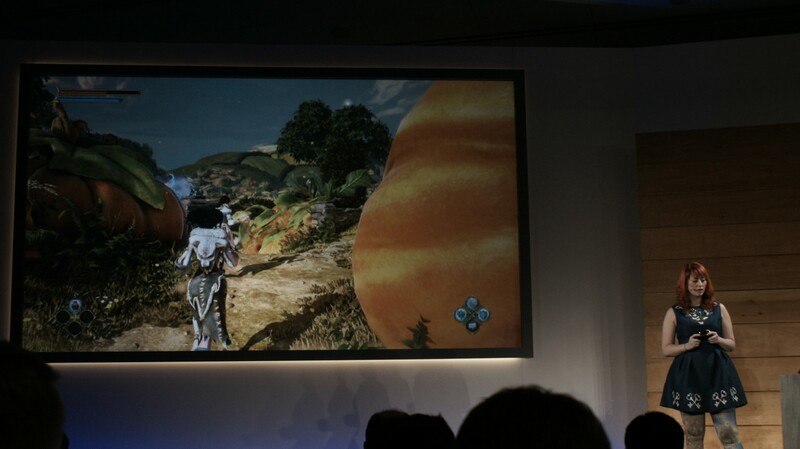 Microsoft also addressed battery life and gaming performance with DirectX 12. The company claims this technology improves graphics performance and cuts battery consumption by 50 percent. Gaming studios that have adopted DirectX 12 includes Unity, Unreal Engine and Lionhead Studios. Lastly, Microsoft will allow you to stream Xbox One games to your PC or tablet, and Windows 10 will come to Xbox as well. This feature will arrive later this year. 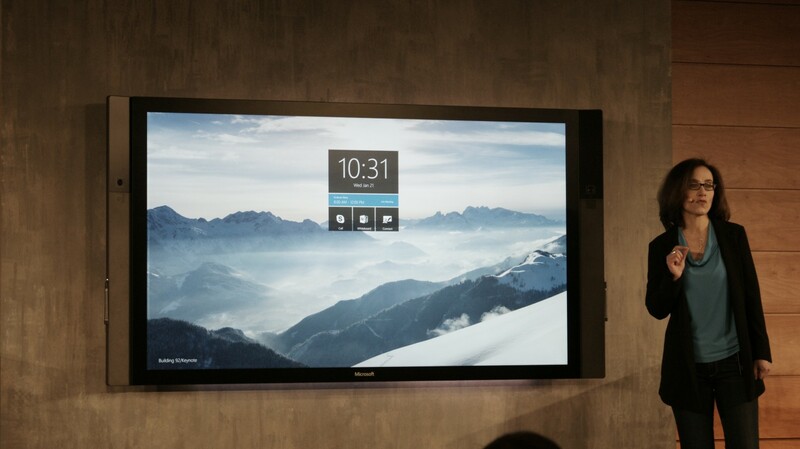 On a slightly-unrelated note to Windows 10, Microsoft showed off its Microsoft Surface Hub, a 4K display screen for businesses. It’s essentially a really, really big tablet that lets you showcase presentations, make Skype calls and write on it like a whiteboard – all powered by Windows 10. If you markup the screen during a meeting, you can also save this to OneNote and share afterward. 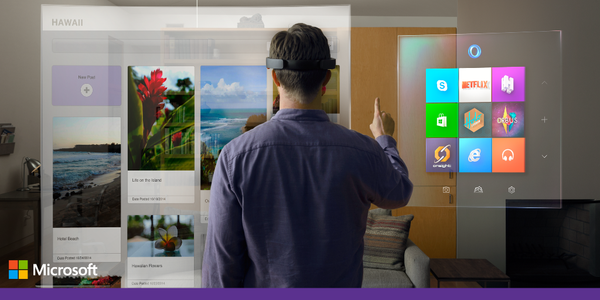 Microsoft introduced Windows Holographic, a new API to add a layer of augmented reality to Windows 10. Developers can now add holograms to their apps with this new technology, viewable through Microsoft’s special goggles, Microsoft HoloLens. The smart goggles can understand users’ gestures, voice and the spatial area surrounding them. You can also create your own holograms and 3D objects, then print them via HoloStudio. 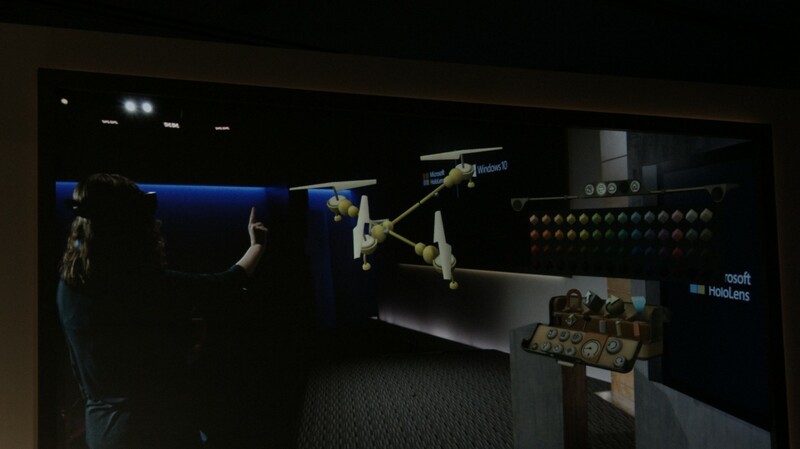 In the demo, a woman built and customized a quadcopter with the augmented reality app using gestures and voice commands. Microsoft ended its event with outlook for the year, from gaming to hardware to software, while also plugging its upcoming Microsoft Build Developer Conference this spring.